Amid US President Donald Trump's push to stimulate US car production and exports, three major American carmakers are facing a disruption in the supply of parts stemming from a lack of diversification and fuel-efficiency regulations. Kristian Rouz - Several major US carmakers, including Ford Motor Co., are experiencing factory input disruptions after a major fire at a Michigan-based auto parts supply facility. This comes amid a solid demand for cars in the US, driven by an ongoing expansion in auto lending. Meanwhile, US President Donald Trump's trade and broader economic policies - aimed at boosting the production of motor vehicles in the US - are adding upward pressure to the costs of auto parts. This will likely support further gains in factory output costs, as well as broader inflation, allowing the US Fed to continue raising base interest rates. The auto-parts shortage has so far affected Ford, Fiat Chrysler, and GM. Ford was forced to announce a temporary layoff of some 7,600 workers at its Michigan facilities, which produce the F-Series pickup truck - the most in-demand domestic-made car in the US. "We're confident that any impacts will be short-term," Ford Vice President Joe Hinrichs said. It is yet unknown whether the affected auto-makers will substitute their local supplier with a different parts manufacturer, move to produce parts at their own facilities, or turn to imported parts, at least for a while. Meanwhile, car dealers across the US are concerned that they might run out of motor vehicles for sale, as the impending summer season is expected to demonstrate the highest demand for cars in many years amid the broader economic acceleration. Additionally, GM has partially halted its production of vans at its Missouri location, whilst Fiat Chrysler suspended the production of its Pacifica minivan in Windsor, Ontario. The fire in question occurred on May 2 at the main facility of the Meridian Magnesium Products of America industrial park in Eaton Rapids, Michigan. The facility, which produces structural auto-parts, has become one of the main US parts-makers due to its use of lightweight metal alloys, allowing carmakers to boost the fuel-efficiency of their products. "There's a lot of demand for these light-weighting materials," Kristen Dziczek of the Center for Automotive Research's Industry, Labor & Economics Group said. "Everybody needs it. Everybody wants it, and the supply chain isn't mature yet for this kind of volume." Many carmakers are expecting the Meridian Magnesium plant to resume its operation soon, despite the heavy damages it suffered in the fire. Ford said that despite supply disruptions, it is aiming to meet its yearly earnings target of $1.45-1.70 per equity. This comes amidst the Trump administration's push to revive car manufacturing in the US. 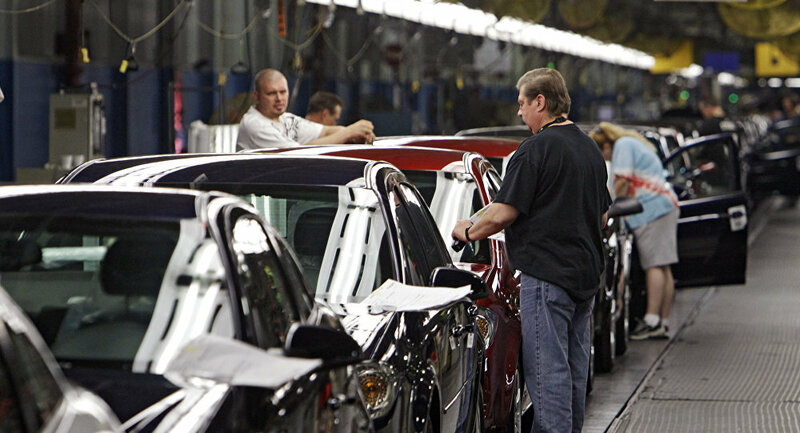 Government officials have put a lot of effort into securing more favorable foreign trade conditions during the NAFTA negotiations with Canada and Mexico, as one of the agreement's main issues has been the production and trade in cars. The US President himself has repeatedly urged carmakers to build more cars in the US and sell them abroad. "So these are the biggest in the world and we're going to be talking to them. And we want them to build more cars in the United States," Trump said last week at a meeting with CEOs of the Detroit Three. "And also, build them here and ship them overseas." While Trump vowed "other incentives coming" aimed at supporting US automakers, the government might be considering measures to boost and diversify car parts production as well. The recent incident has demonstrated US carmakers' exposure to random accidents - such as the May 2 fire - stemming from the insufficient parts supply. Some say the affected carmakers could turn to other US parts manufacturers that produce similar products, but use traditional alloys. This would mean decreased fuel-efficiency for the final product. The problem is that heavier cars might not meet the governmental fuel-efficiency and air-pollution regulations - part of Meridian's success in the recent years. Meanwhile, car buyers could also opt for more economical Asian-made vehicles, even though those might come at a higher cost. Ford, GM, and Fiat Chrysler have also moved some of their workers to make other car models, the production of which was not affected by the disruption in parts supply. Meanwhile, union bosses at some assembly facilities say they have a large enough stockpile of parts to still be running 10-hour shifts. This might soon change, however, but leadership at the affected companies is committed to finding a solution - most likely, boosting the output of car models other than those affected by the parts shortage. The cause of the May 2 fire remains unknown, albeit witnesses reported massive explosions around the time of the incident, and at least two people were injured.